What are the best electric smokers in 2019? Smokers (not that kind of smoker) are highly functional devices that are mainly used to cook a large variety of food—from salmon, pork and even to Thanksgiving turkey. They have different sources of energy/fuel which they use to accomplish their work. One of the most popular method/choice is the electric smoker. An electric smoker can be used for both cold smoking (below 60 degrees F) and traditional barbeque ( around 225 degrees F). Furthermore, they are highly convenient due to their automation systems – which can be used to schedule cooking periods where the smoker will turn off after the elapsed time. So, presuming you need an electric smoker (for smoking fish, vegetable, meat and numerous others), and you find it tedious/time-consuming to go through hundreds of products. On that front, below is a list of excellent electric smokers (with their pros and cons) that you can choose from. Buyers loved the Masterbuilt Electric Smoker because of its ease of use, reliability, and speed (which it cooked food). Setting the smoker up is not tedious and it can easily be done by beginners, provided of course they follow the instructions. Also, build quality is an important factor that devices like smokers must have, and the Masterbuilt Electric Smoker did not disappoint in this regard. Users liked that it was light, but did not sacrifice its durability/build quality which ensures a good lifespan. And on the topic of build, space is one more area users loved about it. They commented that the electric smoker could easily accommodate their needs. Furthermore, its automation system (and remote) is a favourite of users, where unlike other types of smokers, you don’t need to keep dumping in fuel—just set a temperature and watch the food sizzle. One major disadvantage about this Masterbuilt Electric Smoker is the build quality of the digital screen. Which for the sake of monitoring the smoker’s temperature is vital. User complaints ranged from visibility issues in the sun, to faulty screens where some numbers were missing. Also, customers, who were interested in cold smoking their food were a little disappointed when the smoker itself could not properly accommodate the usage/size of the cold smoking attachment. 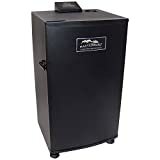 Overall, this is a great electric smoker for you to buy, and since its disadvantages are minor (depends on perspective), it’s a great buy if you’re willing. An automation system according to users is what makes this smoker their favourite. They commented that its smoking prowess was incredible and due to the large space, they could easily smoke enough food for a mediumly large family. Also, build quality is another one of the Char-Broil Vertical Electric Smoker’s advantage. It is built durable and sturdy—and according to users, it ensures a good lifespan. Furthermore, the assembly isn’t a problem since it doesn’t require experience (evidence are beginners who managed it on their first try). Though, properly perusing the user manual or an external source is a must. The one major disadvantage is the build quality which is ironical since different users liked that about it. This from the comments users made was due to the fast shipping, where the electric smoker had multiple dents in it. Also, users were disappointed with its gimmicky door, which just couldn’t close up due to poor alignment. As a result of this, heat escaped the smoker and it led to inefficiency on its part. Lastly, users complained that the power cord could be longer, which for the sake of convenience is important (as it ensures excellent user experience). Presuming you can ignore and properly manage the Char-Broil Electric Smoker’s shortcomings, then you should certainly give it a buy. A thermometer that is functional and not just for aesthetics alone is one of the features of the Bradley Smoker that many customers loved. Users commended its ability to smoke different varieties of food (fish, cheese, meat etcetera) regardless of the temperature it needs to do so. Also, users loved its automation system which can be used by both professional smokers and beginners. According to them, just set a time and temperature for the food to sizzle and it’s ready to be served. Build quality is also not an issue and this according to users secures great lifespan. One more thing that beginners like about this item is its assembly, which is very easy and doesn’t even need an instruction manual to manage. And the fact that it can be easily disassembled at any point for cleaning is just remarkable and well liked by consumers. Mostly, users complained about heat instability. The electric smoker from what users said could not hold heat and it affected their overall experience with the smoker. This is disappointing because it betrays the smoker’s main purpose (which is simply to smoke). In some cases, users complained about bad shipment where the electric smoker was in poor condition when it arrived. All of these things would have easily been ignored, but users couldn’t do that due to its cost. Consequently, from comments made by users, the value for money could have definitely been better. Provided that you can ignore these disadvantages, you definitely give the Bradley Electric Smoker a buy. A good space for smoking food and great build quality is a nice combination that has been tested and the results were remarkable. The Smokehouse Electric Smoker is one that has utilised this combination and users love it. Users love the smoker’s ability to reach varying temperatures in order to smoke different kinds of food (cold and hot smoking). Furthermore, using the electric smoker is very easy and it’s an advantage that will be appreciated by experts and beginners alike. To conclude its advantages, the smoker has a lifespan that promises excellent user experience—which is as a result of its build quality (already mentioned above). All-in-all, this is a great electric smoker. Other than complaints about built quality (from some users) and bad shipment, the Smokehouse Little Chief Electric Smoker doesn’t have any other disadvantages. Though, do keep in mind that there are company defects and the first disadvantage (about build quality) might be due to that. Overall, this is an excellent smoker if you can ignore these minor inconveniences. The Char-Broil Deluxe Digital Electric Smoker has excellent build quality which includes/secures design language, space(for smoking), sturdiness, and lifespan. Where the latter is one advantage that users particularly love. As commented by users, the electric smoker is capable enough to hot and cold smoke any food you throw at it—due in part to its consistent temperature. Also, assembling the electric smoker is easy and can be managed by beginners. Likewise disassembling it for a quick clean up. Another major reason why users complimented the electric smoker was its huge wood chip box which has plenty accommodation. Which is simply for the sake of convenience and excellent user experience. Incorrect thermometer, defective products, and heat instability are the three major disadvantages of the Char-Broil Deluxe Digital Electric Smoker. These three alone are the sources of most of the complaints that are reported by users. In the case of company defects as an example, users complained that the product stopped working after some usage and they promptly had to return it. Also, in a few other cases, the thermometer led to uncooked meat/fish due to the fact that it supplied poor information. Nevertheless, if you can ignore these disadvantages, you should certainly give the electric smoker a buy. 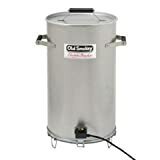 This Masterbuilt Electric Smoker is loved by users for its excellent design, build quality, and reliability (in terms of temperature and others). The build quality in particular allowed users to save up on wood (for flavouring) since the enclosed confines of the smoker allowed users to maximize wood smoke. The smoker as remarked by various users is also easy to assemble and operate, which makes it highly suitable for beginners. Also, due to its excellent design, there’s enough space to accommodate the needs of users and cleaning it is very easy too. 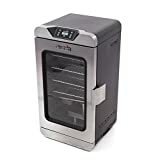 Overall, this is an excellent electric smoker that will comfortably handle any challenge (meat, cheese, fish etcetera) you throw at it. Lifespan in a few cases is an issue which is ironic as users loved the smoker’s build quality. This, in turn, gets worse as value for money is now non-existent. Also, the remote that can be used to monitor the smoker’s temperature is gimmicky at best and useless at its worst. This can cause complications in the smoker, and user experience might be affected at the end of it all. This Masterbuilt Electric Smoker is fit for both expert smokers and beginners. According to users, assembling the electric smoker was easy, as well as operating it. Buyers remarked its remarkable build quality and its great value for money. Also, the design language is excellent and allows plenty of space to accommodate food. As well as the fact that it is very easy to clean – expert or not. Furthermore, the smoker’s wood chip feeder (due to its automation system) is exceptional, and when users programmed a temperature and cooking time with it, the results were satisfactory. Lifespan is an issue that many customers have faced with this electric smoker. Though, do keep in mind that the smoker only fails after rigorous use. Users complained about company defects (smoker malfunctioned) and how the smoker itself is not weather-proof. This mostly affected their overall user experience with the smoker – just after getting it. Nonetheless, if you can ignore the disadvantages above, then the Masterbuilt Smoker with Window and RF Remote Control is fit to handle your needs. The Old Smokey Electric Smoker according to both experts and beginners is easy to operate and assemble. Users loved its compact design which did not sacrifice food space in any way or form. Also, the electric smoker is very easy to clean which will be needed because after all, its a smoker, albeit an electric one. The value for money was also commended likewise the shipping which was excellent (both speed and condition at/in which product arrived). Furthermore, the build quality from many of the comments made by users is exceptional and also ensures excellent lifespan. 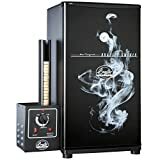 The Old Smokey Electric Smoker also features a great customer service which users appreciated since they handled any complication or issue that users faced. A lack of built-in thermometer is one thing that users complained about. Likewise, problems ranging from heating issues to the smoker malfunctioning. Other than these disadvantages, the Old Smokey Electric Smoker is perfect for your needs. From fish to meat, and even to vegetables, the Smoke Hollow Electric Smoker is capable enough to handle your needs. Users remarked that the smoker gets incredibly hot and hence, it cuts cooking time. Coupling this with its functional temperature device (control) makes all kinds of smoking possible (cold and hot). Also, it has excellent value for money at the expense of almost none of its other features/advantages. Furthermore, the smoker is easy to assemble and clean which makes it suitable for experts and beginners alike. Overall, the Smoke Hollow Electric Smoker is a capable electric smoker. The only disadvantage that the Smoke Hollow Electric Smoker has is its subpar build quality. Users made known that leakage occurred when the smoker was in use and this, in turn, affected user experience. Other than that, the electric smoker’s prowess satisfied users regardless of the kind of food (meat, fish, vegetable, etcetera) they were smoking. Four chrome-coated smoking racks - smoke 80 lbs. of food! This Masterbuilt Electric Smoker has one major advantage—which is its automation system. The smoker according to users can be easily adjusted depending on what you want to smoke (cold and hot smoking) and the remote can be used to monitor its activities. Users also commended its excellent build quality likewise its ease of operation which makes it suitable for beginners. Furthermore, transportation (portability) is very convenient due to its wheels and assembling the item is also hassle-free (provided you follow the instructions). Lastly, value for money is excellent—where none of its features were sacrificed. From comments made by users, it’s either there are company defects or the lifespan is just poor. Users complained about the product losing heat easily and the remote (defective product) not working in some cases. Which is disappointing since it affected the smoker’s overall smoking prowess—as made known by various users. In some cases, the temperature of the smoker also couldn’t be adjusted and the food came out poorly done. Furthermore, the smoker leaks which is a sure sign of cheap build quality (ironical since users commended the build quality). In summary, users suspected that their copies were defective since a much larger group of users made no complaints and otherwise made recommendations. The Jim Beam Bradley Outdoor is an excellent choice for beginners and experts alike. Users commended its build quality which could comfortably accommodate heat of varying degrees (cold and hot smoking). They also used and commended its automation system which is used to set a time duration and temperature. Where hence afterward, food is always ready. Also, assembling the smoker is very easy likewise its operation—which are the two main reasons why this electric smoker is suitable for use by beginners. Users complained that there is no internal thermometer to measure meat temperature. Though, this can be remedied by buying a standalone meat thermometer. Other than the disadvantage above, problems like heat instability, difficulty controlling the temperature, and broken hardware are mostly due to company defects and bad shipment/packaging. Above is where you’ll find the advantages and disadvantages of some remarkable electric smokers that you can buy. Yours is to choose the one that will satisfy you your needs and wants.